The expert jury of the EU Business News Magazine from Great Britain has given the "EU Business Award 2018" to the engineering office Killet Software Ing.-GbR (KilletSoft). 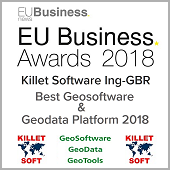 KilletSoft was honored in the category "Best Geosoftware & Geodata Platform 2018". Speaking about the outcome of the awards programme, Awards Coordinator Jessie Wilson commented: "It is with great pride that I showcase the best of the best from across the entirety of the EU. I am proud of all my winners and wish them the best of luck for the future. I hope this award brings you great success and leads to even greater achievements!" "We are pleased that we have been awarded with this coveted prize. I am convinced that the award was given to us because our software continuously benefits from user feedback. Thanks to the users numerous small and large improvement suggestions, we are constantly increasing the quality of our software" KilletSoft's development engineer Fred Killet explains. 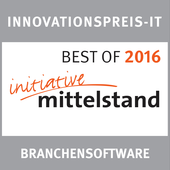 The expert jury of the Initiative Small and Medium Enterprises under the auspices of the TÜV Nord Group has accorded the Innovation Award "Best of 2016" for the second year in succession to the consulting engineers Killet Software Ing.-GbR (KilletSoft) for their geodetic program TRANSDATpro as best IT solution. KilletSoft's Coordinate Transformation Program TRANSDATpro has been awarded in the category "Business Software". "We are very pleased that the Initiative Small and Medium Enterprises for the second time has given us this coveted prize. After being awarded in the last year we had a big increase in customers. This has inspired us to invest additional development power in the awarded software. The expert jury has rewarded our efforts by a renewed recognition" KilletSoft's development engineer Fred Killet explains. The expert jury of the Initiative Small and Medium Enterprises under the auspices of the TÜV Nord Group has accorded the Innovation Award "Best of 2016" to the consulting engineers Killet Software Ing.-GbR (KilletSoft) for their geodetic program ORTWIN as best IT solution. KilletSoft's Community Directory and Locality Research ORTWIN has been awarded in the category "Applications". ORTWIN is a program for the country-wide inquiry of the cities and towns, localities, postal codes and dialing codes in Germany. It finds postal zip codes, dialing codes, coordinates and ground level elevations. The program determines municipal codes, local center points, car license codes, topographic maps, Unlocodes and much more. It arranges localities hierarchically into the structures federal state, administrative district, rural district, town, municipality, local quarter and domicile. The program performs perimeter searches and distance calculations. It finds landscapes on different levels, natural units and climatic data like snow- and wind load zones and solar irradiations of all localities. The expert jury of the Initiative Small and Medium Enterprises under the auspices of Microsoft has awarded the Innovation Award "Best of 2015" to the engineering office Killet Software Ing.-GbR (KilletSoft) for their geodetic program TRANSDATpro Coordinate Transformation as best IT solution. "We are proud to get this coveted Innovation Award. I am convinced we won the award, because our software continuously benefits from user feedback. Again we have realized suggestions from our customers in the latest release of TRANSDATpro. Thanks to the numerous small and large improvement suggestions we constantly increase the quality of our software" KilletSoft's development engineer Fred Killet explains. Our Interntet Site is awarded in the publication "Internet for Geographers" under the title "Most recommended entry Point for Internet users interested in Geography". The book is published by Primus Publishing, Darmstadt, as well as Darmstadt Science Books Society (ISBN 389678112X).